Here in the New England, we are anticipating a winter storm that's supposed to be a whopper. That means a good bit of time out in the cold, snow blowing and shoveling, and one of the things that makes that tolerable is knowing I can come inside to a nice warm bowl of soup. I've really upped my soup game in the past two years. Basil Turkey, Italian Sausage Minestrone, Satisfying Tomato were some of our favorites. But chicken is the protein we eat the most, and I'm always looking for new ways to serve it up. I found this recipe on the cards that are enclosed in my Taste of Home Special Delivery Winter box. I immediately put it in the to try pile because I had everything on hand except for the baby spinach. I made a changes, such as using chicken breast, low sodium broth, an orange pepper, and a can of mixed beans instead of just the kidney beans. It doesn't really get much easier. Just a few minutes prep and then you can just walk away. You can easily swap the chicken for turkey, and use whatever veggies you have on hand. It's a great way to clean out the pantry and the refrigerator! Thanks so much to Kate for hosting #SoupSwap and all of the other #FestiveFoodies for sharing their recipes! Be sure to go and see what they made using the links below. In a 3-qt. slow cooker, combine the first 13 ingredients. Cover and cook on low for 4-5 hours or until chicken is tender. Stir in spinach; cook 30 minutes longer or until spinach is wilted. Top with cheese. 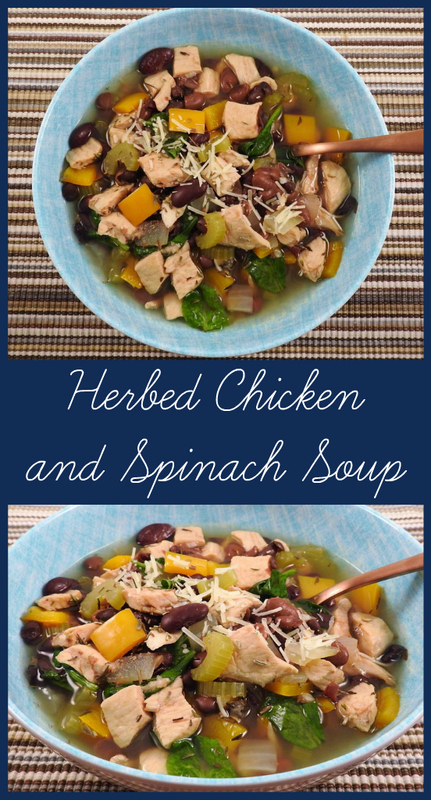 I love all the different components of this soup, definitely will fill you up! This soup looks very hearty and perfect for a snowy day! We are anticipating blizzard-like conditions this weekend here, too! The flavors!! I love the spinach in this soup as well. I try to add spinach to soups and other dishes as often as I can. What a gorgeous and easy soup! So hearty and delicious sounding. I hear that, Jolene! This soup sounds great for an after snow shoveling day! Sounds delicious. This would go great in a thermos to warm the kids on a cold school day. I love how the flavor profile works so well during any time of the year! This is such a great combo of flavors! Thanks for celebrating National Soup Swap Day with us! 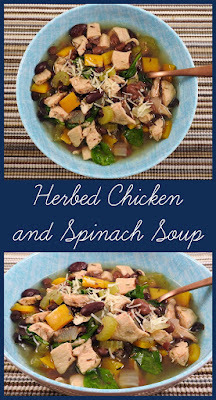 This is such a hearty soups with fabulous flavors. I love that the soup is so easy to make as well. Everything into the slow cooker! The beans are flavorful and everything comes together beautifully. That looks so hearty and delicious! I love a good soup, but it needs to be full of goodies for my husband to appreciate it, so this may win him over too! What a beautiful, hearty, and healthy soup. I would love a big bowl of this during this cold weather! Soup is my favorite thing to make in the winter, and I LOVE how simple the crock pot makes things. This one looks delicious! Thanks so much for sharing at Sweet Inspiration! Now this looks delicious! And souping is huge deal right now!! Going to try this out for sure! Thanks for sharing on "Sweet Inspiration"!